The Minister for Youth and Sports of Ghana, Hon. 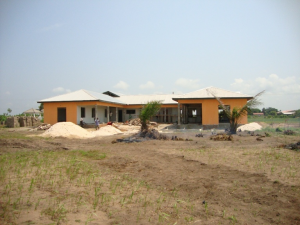 Mr. C. K. Humado will commission the phase one of the Atorkor Centre project on 16th August 2011 in Atorkor. The Phase one which involves the construction of the vocational training and employment centre started in February 2011 and has five workshops, an administration office 2 washrooms ( both with 5 facilities each), large kitchen and covered walkways. The centre will assist the local youth and women to acquire marketable skills to generate sustainable income. The Atorkor Development Foundation, (ADF) is undertaking the establishment of a vocational training for the youth and employment centre in contemporary and traditional Ghanaian arts for the women of Atorkor and area. Over fishing by off-shore trawlers has crippled the local fishing industry resulting in massive unemployment in the area. The Centre will develop two programs running in conjunction with each other. They will target both groups of citizens (the youth and the women) who have been most affected by the downturn in their local economy. The first program will incorporate computer technology, business administration, general agriculture, batik and fibre arts and dress making. All students will be instructed in business administration. The graduating students will receive a certificate confirming their skill level and thereby allowing them to obtain meaningful employment. These programs are scheduled to commence in October 2011. The second program, due to commence October 2012 will focus on training artisans in the traditional Ghanaian arts of, kente weaving, bead and drum making. The artworks will use contemporary designs and the products will be marketed locally, on line, and in North America and Europe. The focus of this program is to promote and expose the fine contemporary Ghanaian arts to the world, whilst giving the women sustainable skills and a viable income! When fully operational the Centre will provide apprenticeship programs and employment for up to 90 youth and women. The construction work was done by the experienced ADF building team (from the Medical Centre and Classroom block), a local labour force of both men and women. Water cisterns will collect roof water for landscaped gardens. A team of women have planted 60 trees, a ‘green’ fence around the perimeter and are clearing the gardens and landscaping. The Atorkor Centre is a truly Canadian project! Initiated by ADF and Canadian artist and entrepreneur Peta Hall, the Centre’s construction is funded by a Canadian family foundation, and the architectural design was by Canadian Brian Clark. The fundraising was spearheaded by Hall with a number of Ontario functions and events. The feature event being “Azadudu” at which Darren Schemmer, current Vice President of CIDA and the past High Commissioner of Canada in Ghana and his wife, Heather Johnston were the guests of honour. Ms Johnston gave the opening address. The Rotary Club of Picton, Ontario, is currently doing a major fundraising program involving many other clubs in Ontario, and has partnered with the Rotary Club of Accra, the oldest Rotary club in Ghana. The funds raised will be used to purchaseequipment for the Centre. Strong local support has been received. The District Assembly in Keta , donated 5 acres of land and has agreed to assist with funding the Centre. UNESCO has agreed to train the Centre’s art instructors.